With all our accounts we provide a FREE virtual terminal that is a secure browser based interface that will enable your business to process mail order, telephone order (MOTO) credit card transactions. You don't even need a website. The Virtual Terminal eliminates the difficulty and additional hardware expenses normally related to manual credit and debit card processing. Our Virtual Terminal provides merchants with the standard features that accompany all of our payment processing solutions. Access your Virtual Terminal from any Internet connection. 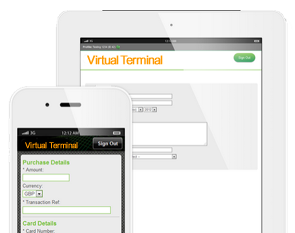 To learn more about the Virtual Terminal we provide, please visit our main information. Transactions are protected by three security options: AVS (address verification system), a negative database check, and CVD (card verification data). The virtual terminal is only FREE (unlike our competitors we do not charge an extra fee) when combined with one of our payment solutions. 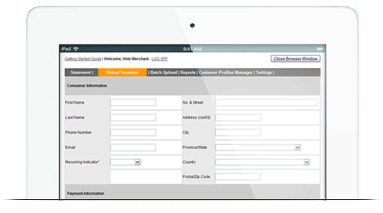 Like all virtual terminals, it must be used in conjunction with a merchant account and / or gateway to operate. We were the very first company to develop the virtual payment terminal back in 1997. Due to the ease of use and mass popularity, this system is now offered by many banks and PSP's throughout the world. The Virtual Terminal has been designed to be used on a range of devices and screen sizes. Therefore it can be accessed from anywhere with a secure internet connection. We can now provide a demo of how the virtual terminal will look and work. For banking security reasons we are unable to provide an actual test account, but have duplicated what the page will look like exactly. You can view both the Basic terminal or the Advanced terminal which both of which come with the account.